Classic and French Country lighting add an important finishing touch. Handcrafted French-inspired girandole lamp. Handcrafted table lamp. Handcrafted of resin. Pleated silk shade. Six arms dressed with crystal beads. Handcrafted lamp with resin and metal base. Very tall buffet-style lamp good for casting light downward. Base, glass mirrors on hand-cast gold polyresin base. Silk dupioni shade. Lamp features arching "branches" bedecked with glass "leaves" softened by a linen shade. Made of metal and glass. Hand-painted champagne finish. Handcrafted, hand-painted eglomisé table lamp with antiqued silver accents. 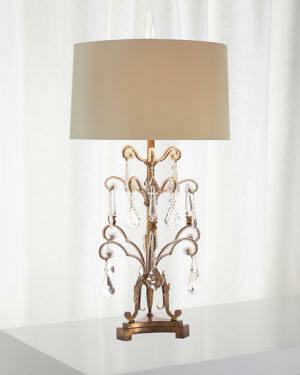 Table lamp with crystal block frame and brass metal fittings. Table lamp with glass and antiqued brass base. Table lamp featuring scroll frame in antiqued finish. This product has proudly been finished by hand. Because of its unique hand craftsmanship, subtle differences should be expected and appreciated as part of its creative design. Table lamp with birch wood base. The original lamp base was hand carved by George Sellers, our resident sculpture and design director. Acanthus shapes and swirls have long been a design trend and staple over the centuries. George was influenced by the original works of Dorothy Draper, the Greenbrier Club located in the West Virginia mountains. This lamp is cast, elevated on feet, and wired to allow both sides of the acanthus swirl to face forward creating the perfect left and right options when required. Handcrafted table lamp of wood, bone, and brass. Courtly check shade and brass finial. Hand-painted table lamp. Iron shade; wood base. Lamp crafted of iron and wood. Table lamp with distressed wood pedestal base. Wood Finishes are not exempt from variations in wood color, grain and texture. Finishes are often purposely distressed and not guaranteed to be a perfect match Expect variations in color, texture and shading. Table lamp with glass and antiqued brass base. A polyresin table lamp in a natural finish with a crystal base. Topped with a round hardback shade in a beige slub linen with a beige/gray trim. Beautiful crystal base with elegant shade Lamp made of glass with a golden finish; acrylic foot. Please note: finish may be darker gold than shown. Cotton shade. Clear crystal base. Pleated organza shade. The Cannes Table Lamp by Visual Comfort brings an organic, fluid presence to your living space, showcasing a sculpted body that flows over empty space. Topped by a seamless linen shade that provides a warm, even radiance. A unique, yet functional addition to reading tables, night stands and other surfaces in need of lighting and ambiance Handcrafted alabaster table lamp with brass accents. A profusion of organic crystals adorn this elegant lamp. Selenite is a soft mineral and some chips are normal. Buffet lamp made of crystal. Linen shade with silver-foil lining. Table lamp with tiered, trellis patterned ceramic base. Drum shade. This traditionally styled antiqued-brass lamp makes an elegant addition to a desk, nightstand, or accent table Ceramic/porcelain table lamp with cutout quatrefoil pattern. Drum shade. Chandelier made of crystal, resin, and chrome. Myriad clear, hand-cut crystals dress this chandelier in dazzling light. Made of hand-cut crystal and polished chrome. Chandelier made of wrought iron and hand-cut crystal. Chandelier made of wrought iron and hand-cut crystals. Silver-champagne finish on the chandelier may be shinier than it appears in this photo and may patina over time Multi-arm chandelier made of glass and metal accented with resin rosettes and historical white-drip plastic candle sleeves. Frame has polished chrome finish. Handcrafted chandelier. Steel and dark blue/gray crystal. Antiqued silver-leaf finish. The Visual Comfort Vestry is a crystal chandelier in hand-rubbed antiqued brass finish. The crystal style is sure to complement any entry. You can't go wrong with a classic like the Hampton, a majestic transitional lighting fixture that looks great in any room of the house. Stylish, modern and minimal, the chandelier features an antiqued gold frame draped with clear cut oyster crystals. The extravagant, floral-inspired Heather Chandelier by Visual Comfort features an open spherical frame adorned with interlocking clear glass flowers and hanging glass accents in a variety of shapes and colors. This decorative globe encases a series of light sources that, once lit, glisten and gleam through the surrounding glass, adding an elegant shimmer to the fixture's warm, ambient light. Hand-cut, golden teak-hued crystals. Iron frame has antiqued brass finish. Hand-cut, golden teak-hued crystals; iron frame has antiqued brass finish. Handcrafted rope tassel hanging lantern inspired by Louis XVI. Handmade steel frame in antiqued gold leaf finish. Antiqued brass lantern with seeded glass inserts and iron candle cups. Lantern-style pendant light designed by E.F. Chapman. Handcrafted of iron and glass. Gilded finish. Handcrafted glass semi flush. Dazzling mini chandelier features multiple faceted crystal droplets to add the shimmer of reflected light to the room Ceiling fixture converts from semi-flush mount to chandelier. Metal and glass crystals. Steel, crystal; gold leaf finish Steel curved arm chandelier. Wood accents.